Our Executive Presbyter, Ralph Hawkins, will be preaching at Trinity church in Mercer (Nov 12) and at Grove City College (Nov 28). Ralph welcomes opportunities to preach or bring greetings during a worship service, as well as opportunities to visit Session and Deacon meetings. Schedule a Sunday or a meeting time by contacting him at 724-528-1610 or ralph@shenango.org. Presbyterian Churches are encouraged to begin collecting sweaters through December 15th. Care for your neighborhoods first, by giving sweaters to neighbors in need in your own community first. Additional sweaters that are left can be brought to the Children’s Museum of Pittsburgh (10 Children’s Way, Pittsburgh, PA 15212) through December 15th. Between December 18 and 22, all sweaters collected will be distributed by the Presbyterian Churches of the Tri-State Area and other organizations to nonprofit agencies that work with families and children in the region. Even as Presbyterian Disaster Assistance began working toward recovery after Hurricane Harvey, Irma and Maria followed close behind, weaving a path of devastation, wiping out islands in the Caribbean and bringing damaging winds and storm surge to Florida. Years of recovery lie ahead, and your commitment will help PDA extend the hands of Christ. PDA is the emergency response and refugee program of the denomination, committed to the long-term journey of recovery of communities adversely affected by a crisis or catastrophic event. It is funded by the One Great Hour of Sharing and raises designated funds for responding to specific disasters. You can send your special offerings and gifts through the Shenango Presbytery office (4197 New Castle Road, Pulaski, PA 16143). Please designate gifts to DR000169-Harvey, DR000194-Irma, or DR000194-Maria. We will forward all gifts on to Presbyterian Disaster Assistance. For more information, updates, and resources (such as a bulletin insert), please visit http://pda.pcusa.org. Help Presbyterians in Puerto Rico recover from hurricane Maria and enable them to minister to their neighbors. Pastor Adolfo Santana- Cordero is the pastor of the PCUSA church in San Juan and personally friend of Beth Creekpaum (of the Sandy Lake church) through the PCUSA’s CREDO program. If your church is interested and willing to collect and mail these items to Adolfo and his church, please contact Beth at TheOtherRevCreekpaum@gmail.com for mailing/shipping instructions. If you personally would like to donate items for mailing or contribute money to help defray the cost of mailing these items to Puerto Rico, please deliver to the Presbytery office and Beth will post them to Puerto Rico on your behalf. Sheet music, cantatas, hymnals. Browse a nice assortment of general, Christmas, and Easter selections and take what you like. All for FREE! Church is located in New Castle. Call 724-674-5209. No matter what the circumstances, grief recovery is a painful process. A GriefShare seminar/support group is being hosted and sponsored by Calvin Presbyterian Church. The program will be facilitated by Ginny Brest. The first session is scheduled for Sunday, September 10 from 1:30-3:30 p.m. in the church parlor. The group will meet each Sunday afternoon for 13 weeks, concluding on December 3. While participants are encouraged to complete the 13-week program if possible, attendance is not mandatory each week. The program is free and open to anyone in the community (and beyond) because we understand how deeply grief and loss hurts people and families. This is a place where many people have found they can begin to put their lives back together again. The program is open to anyone who has experienced the loss of a loved one to help them through the grief process. If you, or someone you know, would benefit from this program, please contact Ginny Brest at 724-758-3838 or the church office at 724-758-4258 or by email at calvinellwood@gmail.com. You can also view the GriefShare website at www.griefshare.org for additional information. It is important to understand grief, to learn coping skills and to have a determination to survive the loss. Hold on to hope and gather with others on the 3rd Wednesday of each month at 6:00 PM at Shenango Presbyterian Church (3144 Wilmington Road, New Castle). Rev. Andy Shaffer, Chaplain at SouthernCare Hospice will facilitate the group. 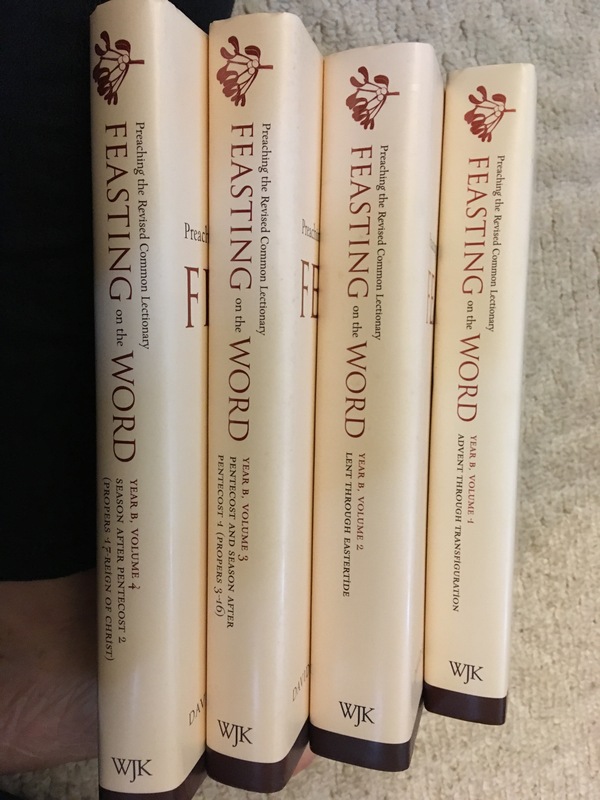 Shenango Presbyterian Church has an extra copy of FEASTING ON THE WORD Year B (just in time) – complete set of 4 volumes. $100 Never used. Make check payable to Shenango Presbyterian Church. If interested call 724-654-2322.